Andrés Alén was a new name to me, but with a substantial catalogue of works and a long list of honours and awards he is clearly one of the distinguished grandees of Cuban music. Briefly having sampled some of this music in advance of receiving a review copy of the CD, I was attracted immediately by the directness of expression in Alén’s music, as well as William Villaverde’s committed and resoundingly positive performances. The disc as a whole confirms and enhances this initial impression. The Theme and Variations on a Theme by Silvio Rodriguez was inspired by Silvio Rodriguez’s song “La Vida”, its ten variations going through a variety of popular forms of music such as the cha-cha-cha dance, as well as classical genres that take the theme into the likes of the fughetta, prelude or nocturne. 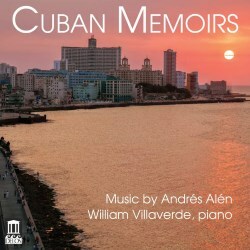 Contrasting explorations of rich romanticism and groovy rhythms this is a highly attractive piece that wears its sentimentality with a light enough touch to escape maudlin wallowing, and engages with its Cuban roots with an honesty that transcends twee stereotype. Unison is a movement from a saxophone quartet transcribed for piano which bursts out of your speakers like the remarkable finale of Chopin’s Second Piano Sonata, its exuberant nature making it a fine miniature for use as an encore. The Preludes are numbered but, composed over many years, are not intended as a set or a cycle. No. 6 launches into Afro-Cuban syncopations and has a modern, potently jazzy feel. No. 2 is also jazz influenced, with plenty of added notes spicing up the chords and delivering a sonorous Big Band feel. No. 1 is dedicated to the composer’s wife, pianist Maria Dolores Novás – opening with a gently inquisitive feel and, with numerous shifts in metre and mood, almost turning into its own mini-concerto. No. 3 is dedicated to another pianist, the composer’s first piano teacher Margot Diaz Dorticós. This has a lyrical feel that builds into climactic passages that brush close to Rachmaninov in spirit while keeping a secure hold on Cuban colours. No. 4 is dedicated to Alén’s second piano teacher Cecilio Tieles, and stands apart in having a slow and ruminative tempo throughout. No. 5 completes the set of dedications, this time to Vitali Dotsenko, the composer’s teacher before he left to study in Moscow. Its Venezuelan Latin rhythms are infused with a continuum of notes both in sensually warm harmonies and an infectious melodic sparkle. Danzón “Legrand” was one of Alén’s early hits and remains one of his most famous pieces. It has a quasi-Scott Joplin feel here and there in this piano version, though it exists in various arrangements. Pianist William Valverde has made his own adaptation which ranges widely over the keyboard and results in a colourful and highly enjoyable performance filled with sophisticated and stylish fun. The final piece is another set of variations, Theme and Variations on a Theme by Pablo Milanés, taking a section of the song “El breve espacio en que non estás” and taking it through fourteen variations which demand considerable technical prowess and stamina from the performer. Alén’s sense of lightness and joy in music making is still very much present, but alongside the jazzy effusiveness there are variations that would not be out of place as competition test pieces. The finale is quiet astounding. This is a very fine disc of some enjoyable and rewarding music. If you the love South American vibe, and (for instance) Astor Piazzolla’s tango nuevo style and are interested in hearing where a combination of Cuban verve and classical depth might take us, then this is a well-produced and supremely well performed place to widen your horizons.